Hip-Hip-HOORAY! It’s our birthday today! Well… not exactly today, it’s on the 20th of May but we like to do things properly here so we’ve decided to have an extra long birthday to celebrate 14 years of serving the best food and cocktails around. Those sweet mixologists have been at it again and baked up a right treat, not only did they want to get The Dial a birthday cake, they wanted to be able to drink it too! 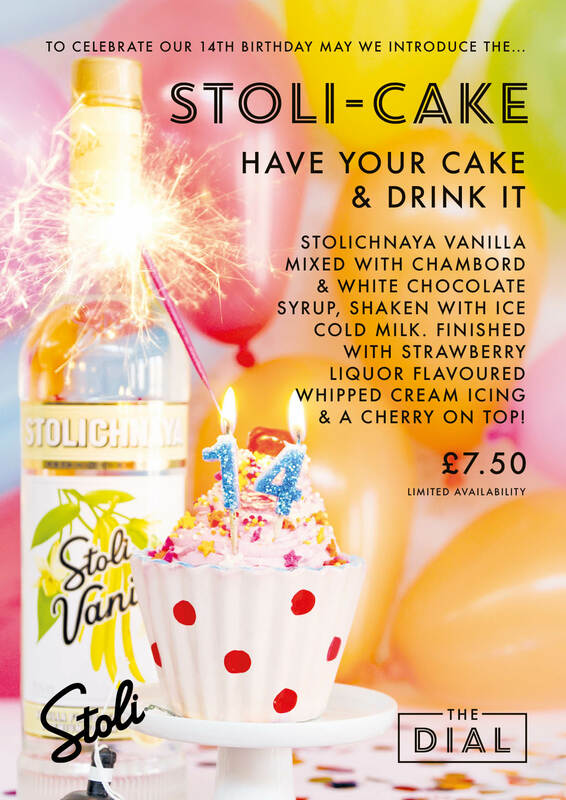 This month we’ve mixed a healthy serving of white chocolate with Chambord raspberry liquor, Stolichniya Vanilla vodka and a dash of milk, to make a luscious cocktail that actually tastes like cake! But we haven’t stopped there, after all, the best part is the icing, right!? So we’ve whipped up a little something special, we mixed whipped cream with strawberry liquour to make a tasty topping to our desirable cake/cocktail. Ok it’s not exactly icing, but it is cream & strawberry liquor mixed together, that’s the next best thing surely! So to get your cake and drink it too, pop on down to The Dial and celebrate another fantastic year with us. Remember to grab a slice or you’ll be in tiers…get it? Tiers, slice, cake….Happy Birthday! !